For other uses, see Catacombs (disambiguation). A procession in the San Callistus catacombs in Rome. The first place to be referred to as catacombs was the system of underground tombs between the 2nd and 3rd milestones of the Appian Way in Rome, where the bodies of the apostles Peter and Paul, among others, were said to have been buried. The name of that place in Late Latin was L.L. fem. nom. pl. n. catacumbas (sing. catacumba) a word of obscure origin, possibly deriving from a proper name, or else a corruption of the Latin phrase cata tumbas, "among the tombs". The word referred originally only to the Roman catacombs, but was extended by 1836 to refer to any subterranean receptacle of the dead, as in the 18th-century Paris catacombs. All Roman catacombs were located outside city walls since it was illegal to bury a dead body within the city, providing "a place…where martyrs tombs could be openly marked" and commemorative services and feasts held safely on sacred days. Grave niches in the Catacombs of Domitilla, Rome. France – Catacombs of Paris. Mine workings were used at end of the 18th century and had no religious purpose other than as an ossuary for storing the bones of cleared graveyards. There are also catacomb-like burial chambers in Anatolia, Turkey; in Sousse, North Africa; in Syracuse, Italy; Trier, Germany; Kiev, Ukraine. Capuchin catacombs of Palermo, Sicily were used as late as the 1920s. Catacombs were available in some of the grander English cemeteries founded in the 19th Century, such as Sheffield General Cemetery (above ground) and West Norwood Cemetery (below ground). There are catacombs in Bulgaria near Aladzha Monastery and in Romania as medieval underground galleries in Bucharest. In Ukraine and Russia, catacomb (used in the local languages' plural katakomby) also refers to the network of abandoned caves and tunnels earlier used to mine stone, especially limestone. Catacombs, although most notable as underground passageways and cemeteries, also house many decorations. There are thousands of decorations in the centuries-old catacombs of Rome, catacombs of Paris, and other known and unknown catacombs, some of which include inscriptions, paintings, statues, ornaments, and other items placed in the graves over the years. Most of these decorations were used to identify, immortalize and show respect to the dead. Decorations in the catacombs of Rome were primarily decorated with images and words exalting Christ or depicting scenes from the Old and New Testaments of the Bible. Much of the sculpture work and art, other than engravings on the walls or tombs, has been preserved in places such as the Museum of St. John Lateran, Christian Museum of Berlin University, and the Vatican. Three representations of Christ as Orpheus charming animals with peaceful music have been found in the catacombs of Domatilla and St. Callista. Another figure was made of gilded glass and dates back to the fourth century, featuring Jesus with the world balanced in his hand and a scroll at his feet. Although thousands of inscriptions were lost as time passed, many of those remaining indicate the social rank or job title of its inhabitants; however, most of the inscriptions simply indicate how loving a couple was, or the love of parents and such. A common and particularly interesting one found in Roman catacombs is the Ichthys, or "Monogram of Christ" which reads ΙΧΘΥΣ, standing for "Jesus Christ, Son of God, Savior". 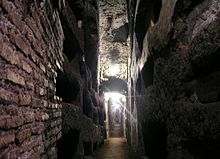 In recent years unique strains of bacteria have been discovered that thrive in catacombs, inducing mineral efflorescence and decay. These include Kribbella sancticallisti, Kribbella catacumbae, and three types of non-thermophilic (low-temperature) Rubrobacter. ^ Other examples include a Neolithic long barrow, an Ancient Egyptian necropolis, or modern underground vaults such as the Catacombs of Paris. ^ "Catacombs", Online Etymology Dictionary, accessed 10 July 2010. ^ Hurst, John Fletcher (1897). History of the Christian Church. 1. Eaton and Mains. ^ Webb, Matilda (2001). The Churches and Catacombs of Early Christian Rome: a Comprehensive Guide. Sussex Academic Press. p. xiv, xi-xii. Retrieved 3 August 2015. ^ "Maltese Catacomb Complexes". UNESCO World Heritage Centre. Retrieved 17 April 2008. ^ "Take a photo tour of the crypts underneath St. Patrick's Old Cathedral". timeout.com. Retrieved 17 April 2018. ^ "Romania Libera:Network of tunnels under the capital city". Retrieved 23 October 2008. ^ Hurst, John Fletcher (1900). Short History of the Christian Church. Harper and Brothers. pp. 87–88. Retrieved 26 August 2015. ^ Hurst, John Fletcher (1900). Short History of the Christian Church. Harper and Brothers. p. 87. Retrieved 26 August 2015. ^ a b Hurst, John Fletcher (1900). Short History of the Christian Church. Harper and Brothers. p. 88. Retrieved 26 August 2015. ^ Hurst, John Fletcher (1900). Short History of the Christian Church. Harper and Brothers. p. 89. Retrieved 26 August 2015. 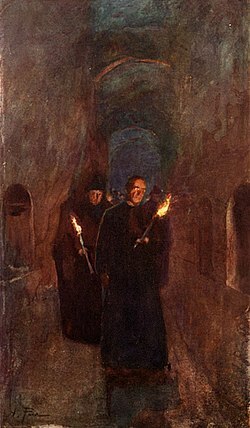 Wikimedia Commons has media related to Catacombs.